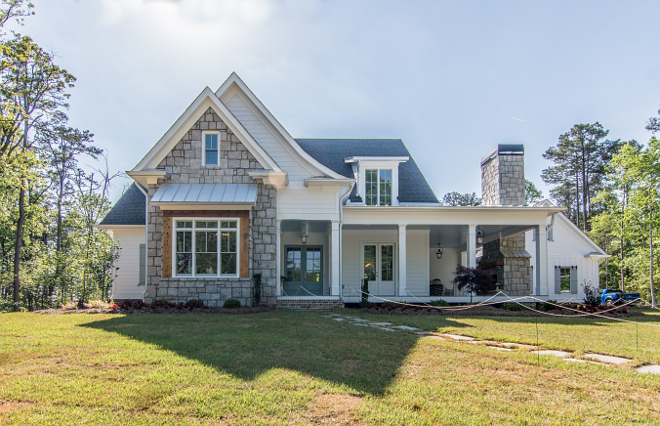 Recently built by Chatham Legacy, a high-end custom building company in North Atlanta, this 5,000 sq ft custom home was featured in the Atlanta Parade of Homes in the Ashley Hall neighborhood in north Atlanta. 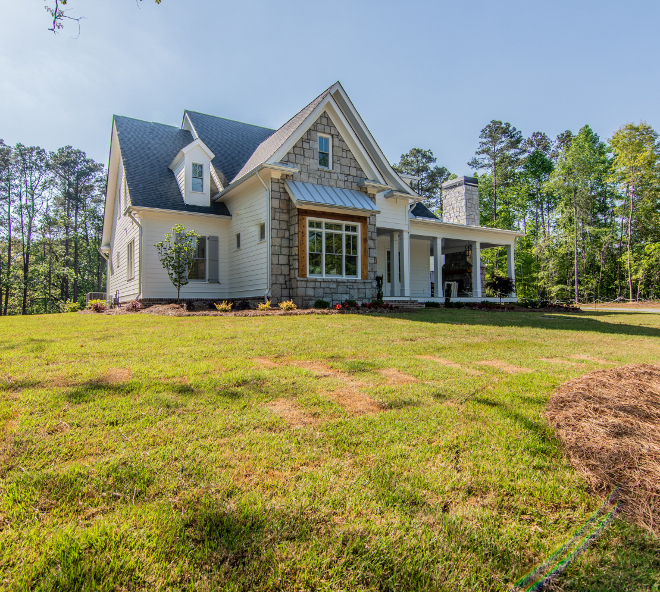 This custom home is nestled on over 2 private acres to recreate the romance of the old family homeplace complete with pea gravel drive, Bevolo gas lanterns, raised wrap-around porch and stone fireplace. 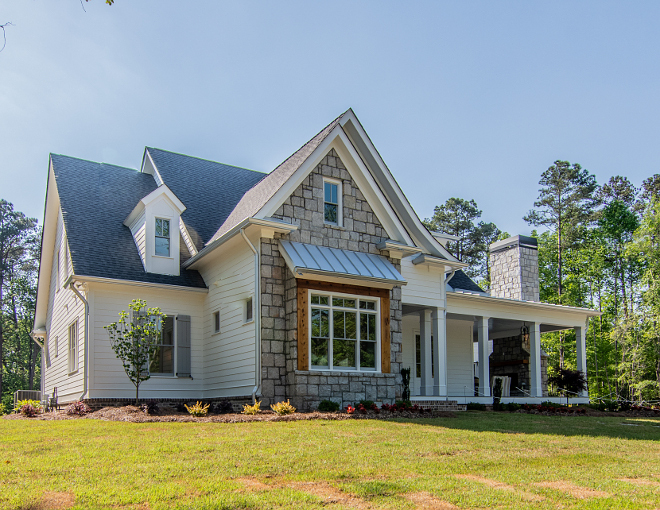 Inside, the home is designed to blend modern conveniences with the artisan craftsmanship of days gone by. 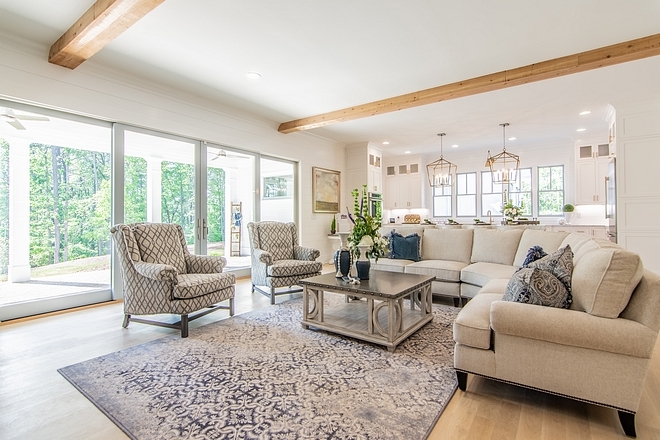 I was very happy to learn that many ideas for this home were actually found right here on Home Bunch. Isn’t it fantastic? This is such a compliment whenever I hear this from my readers and professionals alike. I hope you enjoy this house tour, my friends! 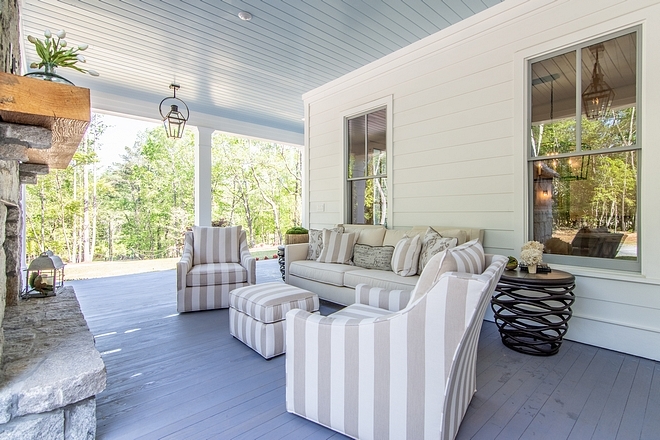 Exterior Paint Color: Sherwin Williams Extra White in Satin Latex. Notice the garage on the right side. I absolutely love the color of this front door. How welcoming! Door Entry Set: Schlage Camelot with Georgian Knob. Beautiful Doormats: Here, Here, Here, Here, Here & Here. Layer your doormat with a 2×3 outdoor runner: here. Porch Flooring: Tongue and Groove KDAT. Stain: Sherwin Williams Blue Denim. Lanterns are Bevolo – similar here. 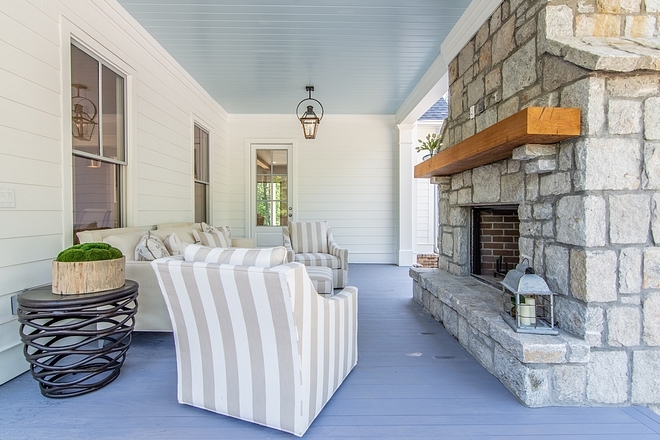 This wrap-around porch features a stunning stone fireplace. Heart: Raised (14″ x 15″). 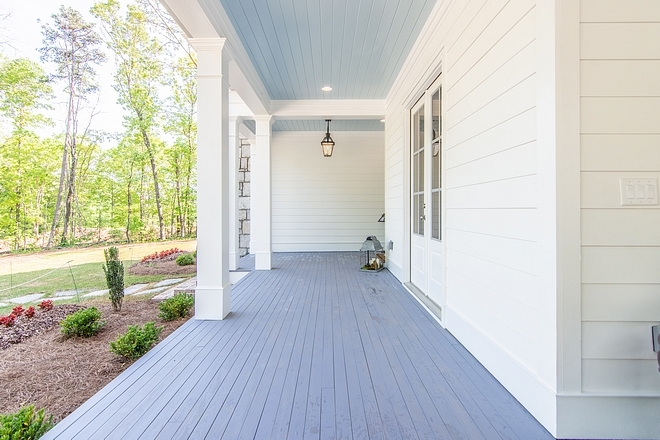 Porch Ceiling: 6″ Pine V-groove painted in Sherwin Williams Atmospheric in Satin Latex. 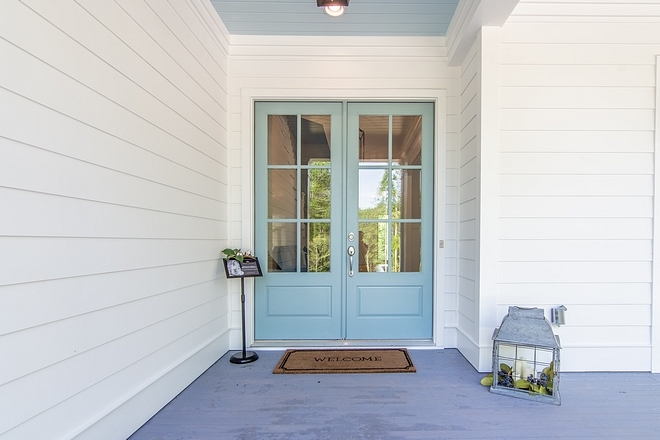 Aqua Front Door Paint Color: Sherwin Williams Interesting Aqua. 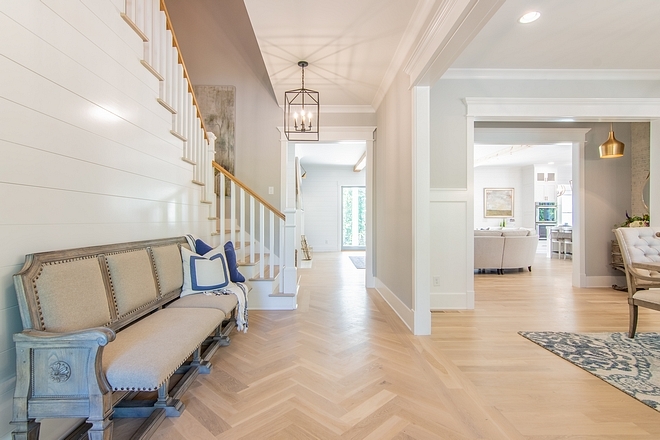 The foyer features herringbone hardwood flooring and mitered shiplap. 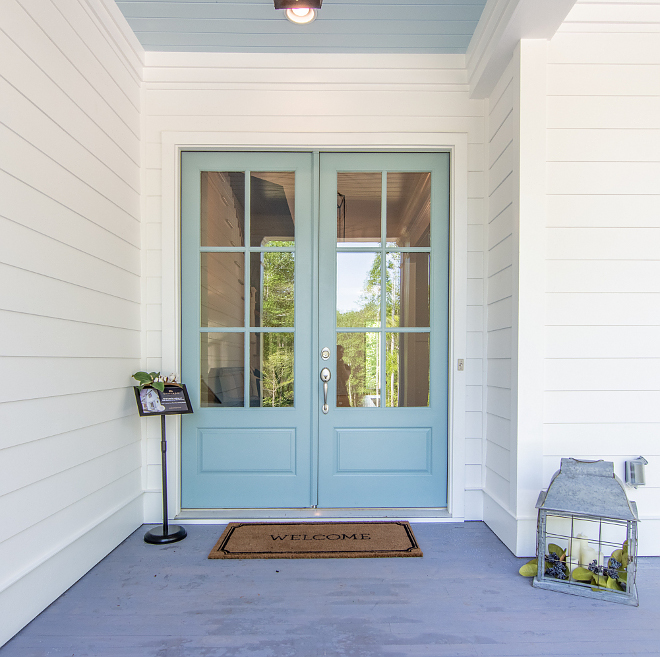 The front door is painted in the same aqua color indoors as well. Affordable Pendants (Big Sales! ): here, here, here, here & here. 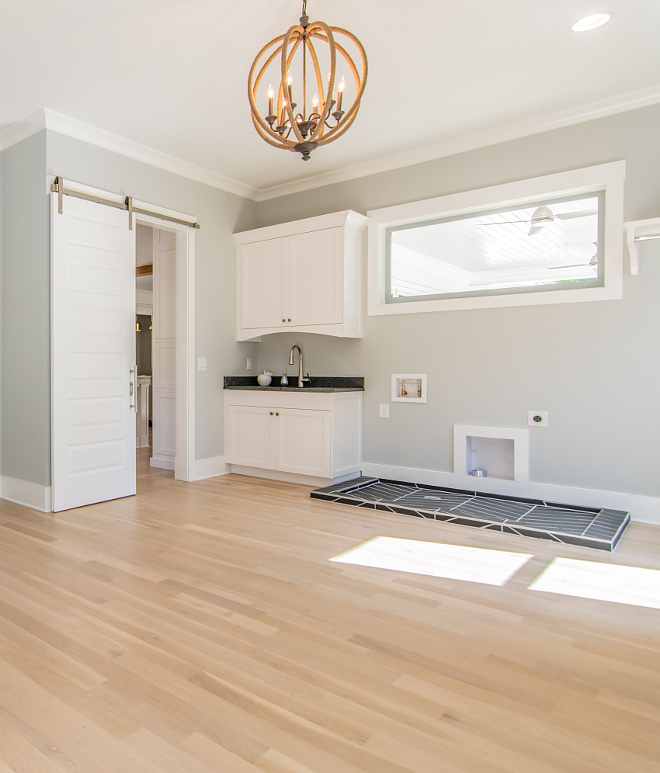 Flooring is 4″ White Oak with Bona Country White stain – similar here & here (different sizes). Foyer bench can be found here. Other Beautiful Foyer Benches: Here, Here, Here, Here & Here. Base: 1×8 MDF (throughout the house). The dining room is conveniently located just off the foyer. Similar Dining Table: Here & Here. 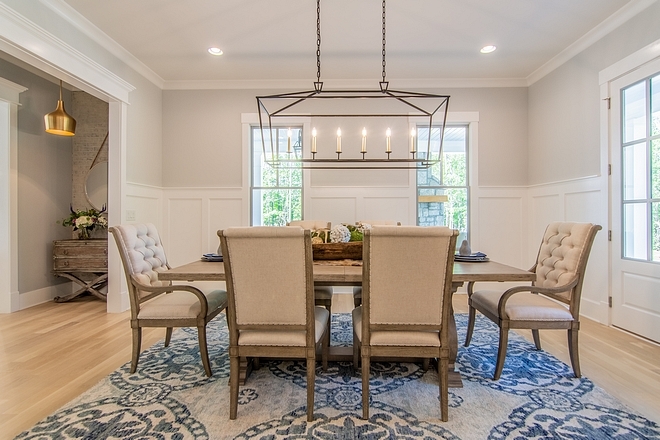 Similar Dining Chairs: Here & Here. Lighting: RH – here & here. The pendant in the Butlers area (left) is Trade Winds. 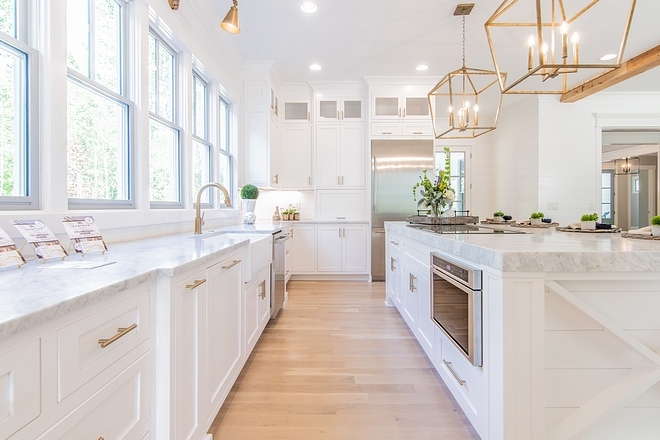 This kitchen really took my breath away. It’s full of great ideas and it feels bright without being “cold”. 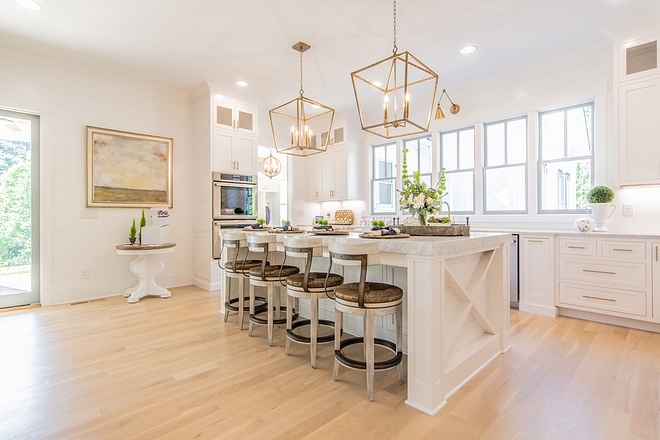 Whitewashed Swivel Counter Stools: Here. 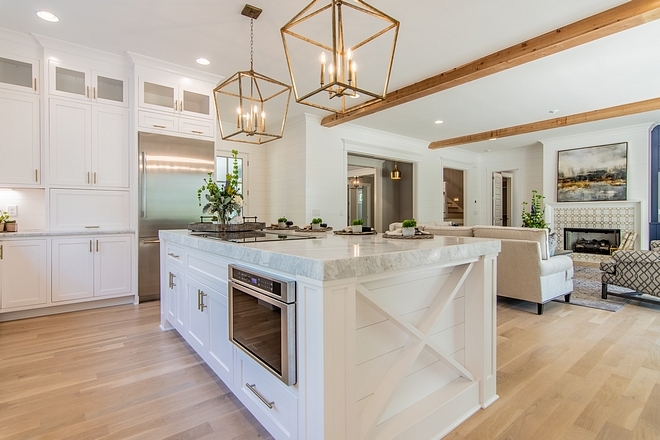 Custom cabinets throughout are by John Wilson of Wilson Handcrafted Cabinetry. 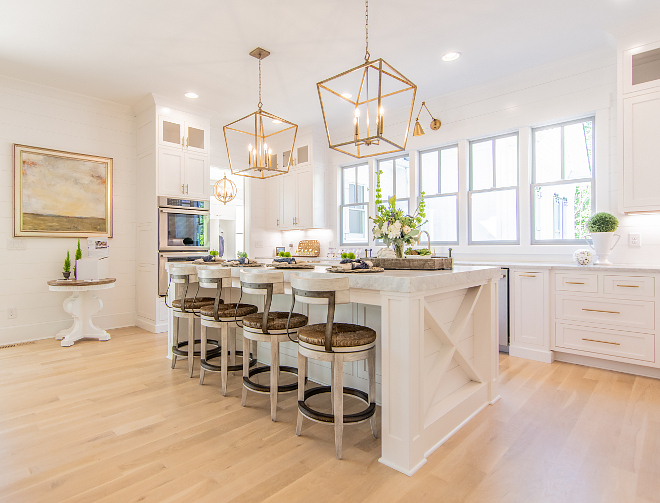 Kitchen Island Dimension: 9×5 – featuring a timber X ends. 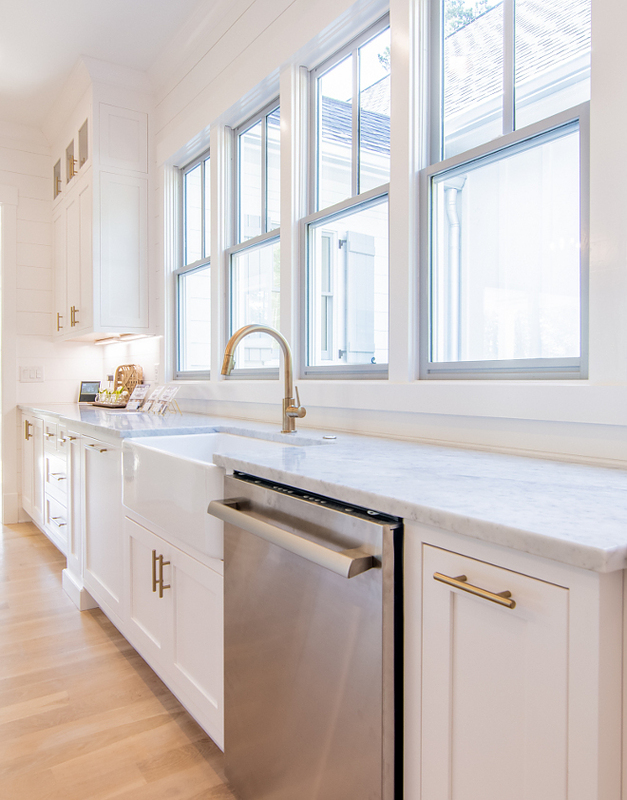 Countertop is Bianco Giulia Marble. 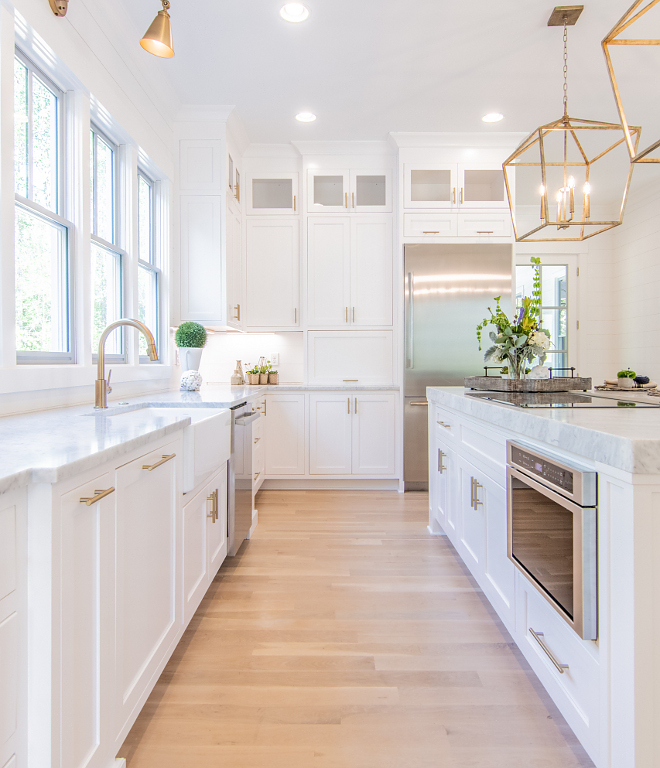 Backsplash is shiplap. Sink: Fireclay 33” Farmhouse Sink. Kitchen Faucet: Delta – Champagne. 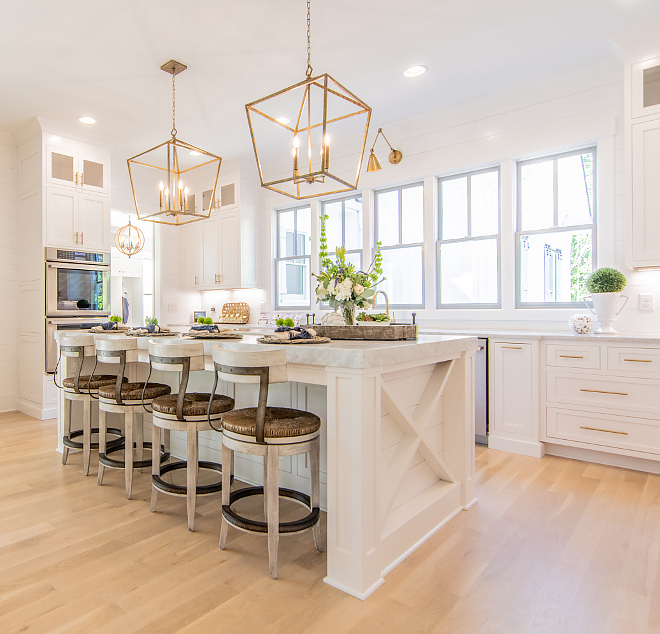 Very Crisp White Kitchen Cabinet Paint Color: Extra White by Sherwin Williams. How beautiful! 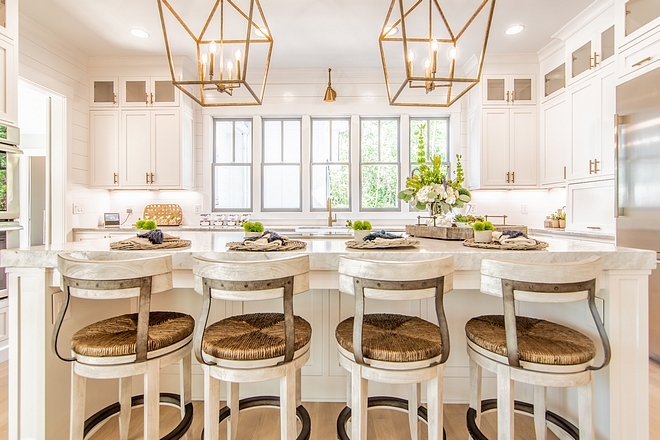 The kitchen island pendants are Millennium Lighting (great price!) – similar here & here. 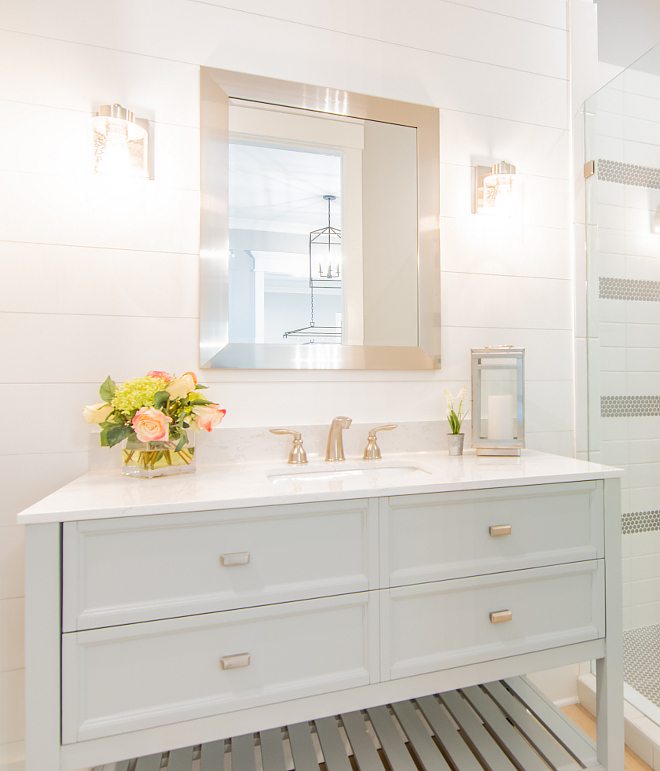 The arm sconce over the sink is Savoy House (on sale!). 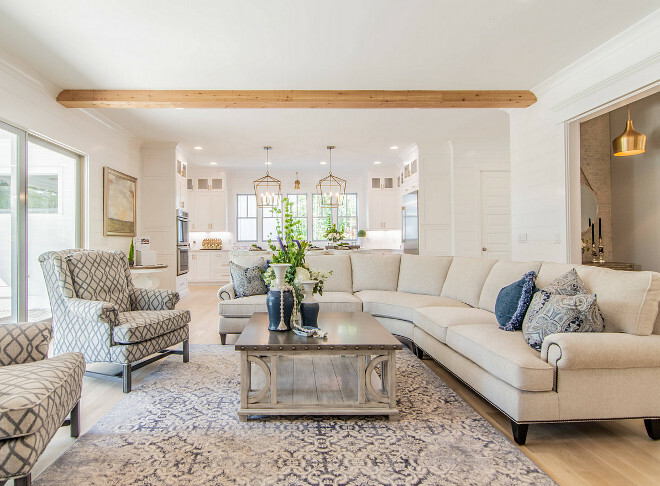 Although it’s hard to tell from this picture, the family room features 1×8 ‘Shiplap’ throughout. Coffee table can be found here. Bookcase Paint Color: Sherwin Williams Naval – Note: The cabinet looks lighter in this picture due the lighting or photography adjustments. The arm sconce over the bookcase is Savoy House. Similar Fireplace Tile: Here & Here. Patio doors are Marvin 16′ Slider. 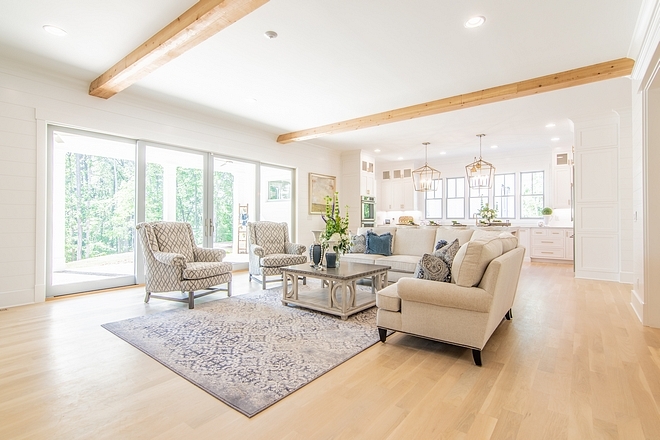 This beautiful family room also features cedar beams (with a clear finish). 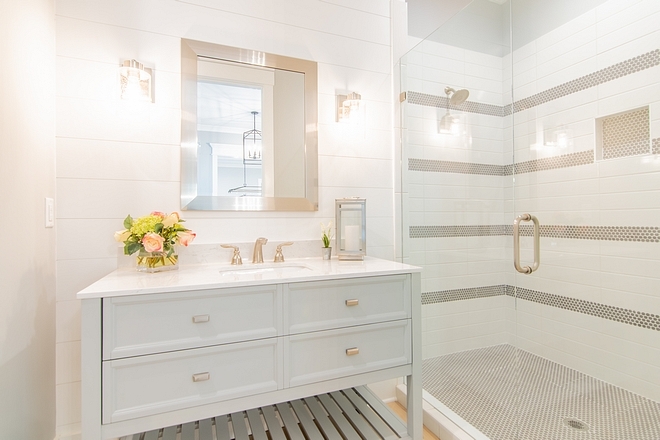 Shower Tile: Subway Tile & Grey Penny Round Tile. Vanity Paint Color: Sherwin Williams Online SW 7072. This room can either be used as a main floor bedroom or office. 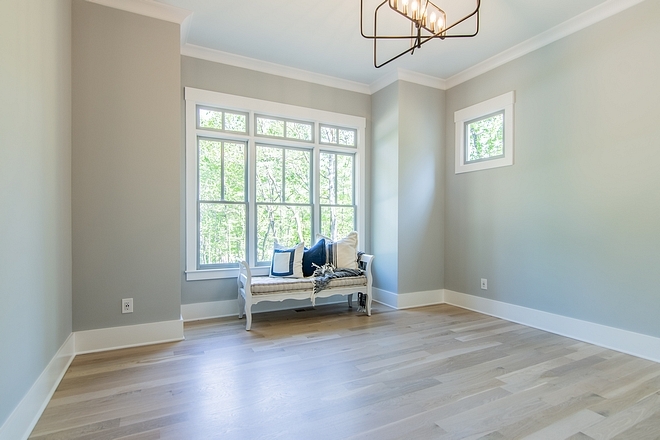 Paint color is Sherwin Williams Passive SW 7064. 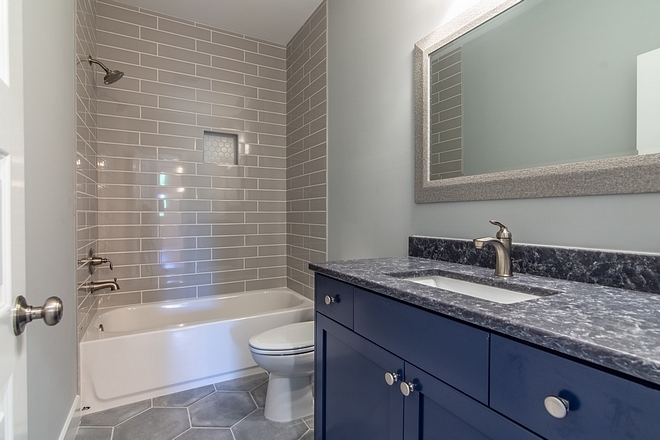 Navy Vanity Paint Color: Sherwin Williams Indigo Batik. Countertop is Silestone Ocean Storm. Similar Grey Subway Tile: Here & Here. Cabinet is painted in SW Online. 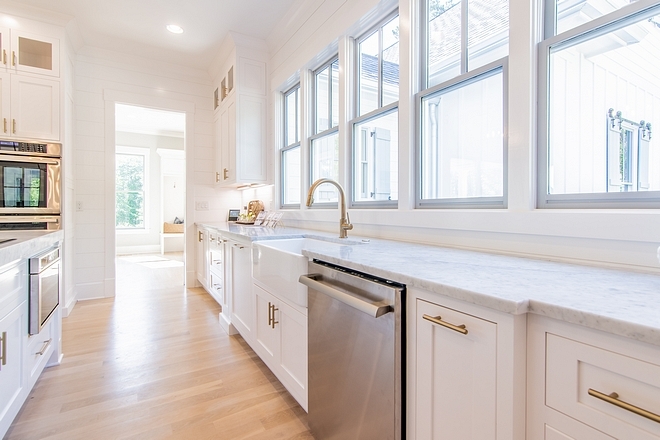 Countertop is Silestone White Zeus. 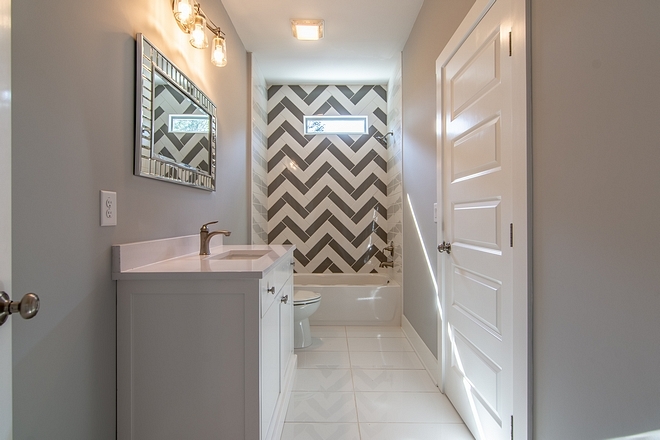 Similar White & Grey Tiles. 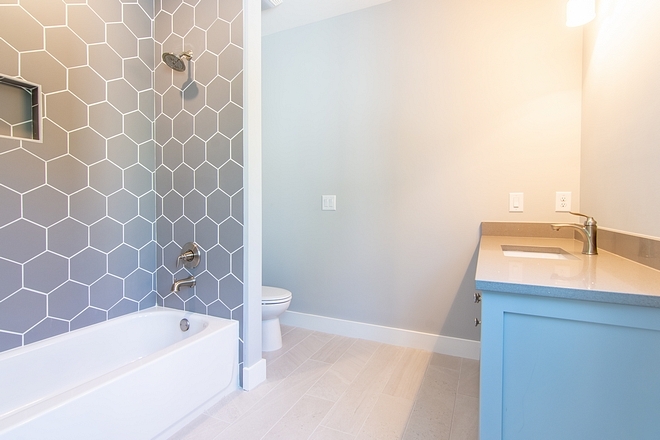 These large hexagon tiles are quite affordable and looks amazing! Similar here & here. Countertop: Vivid Lunar Gray quartz. Paint color is SW Passive – Flat Latex. 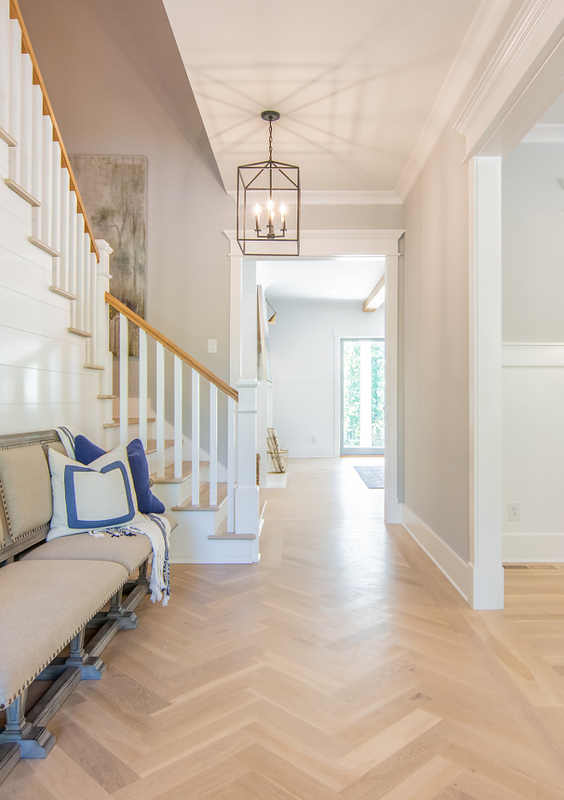 The decor in this space is classic and it will stand the test of time. 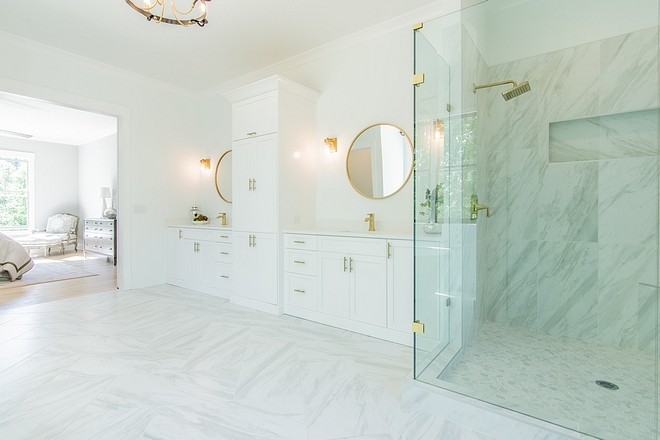 The master bathroom feels very large and elegant. 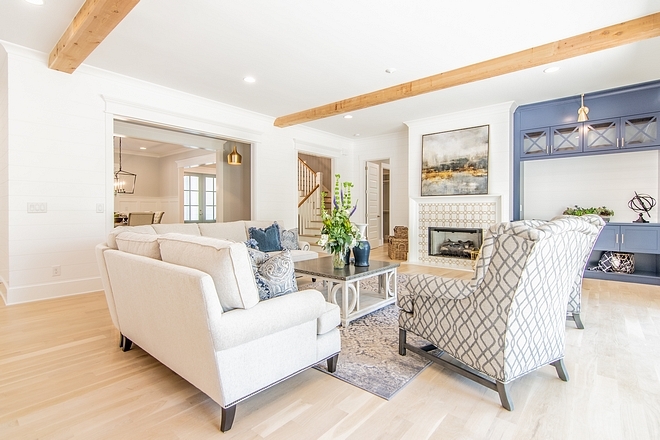 Paint color is Extra White by Sherwin Williams Flat Latex. Cabinets are custom, also painted in Sherwin Williams Extra White. Countertop is White Carter’s marble. 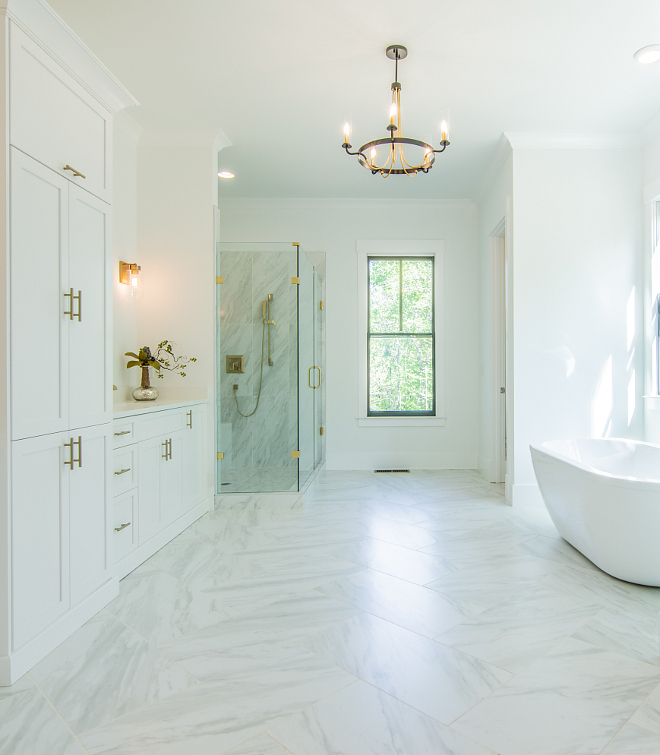 The bathroom features a 67″ freestanding tub. 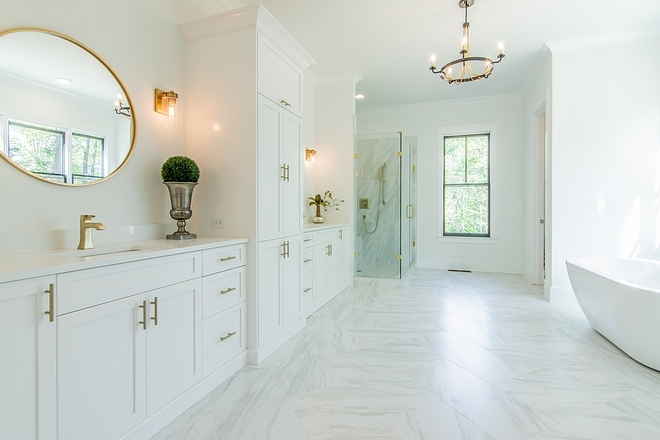 Tile: Volakas Marble – similar here & here (faux marble tile). Master Bath chandelier is Savoy House. Shower tile is Volakas Marble – varying dimensions. 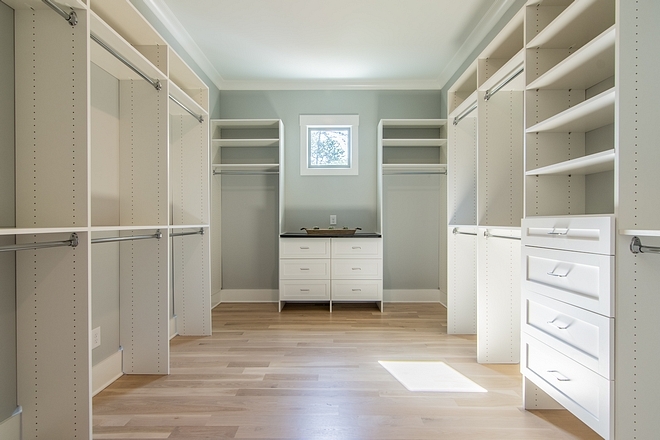 The walk-in closet features White Oak hardwood floors and custom-fit closet system – similar here & here. 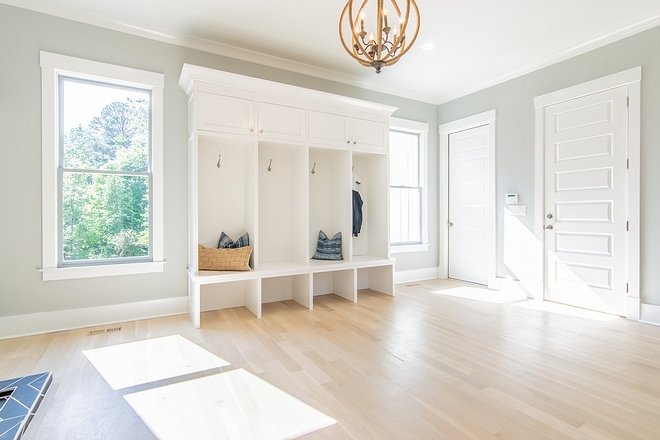 This spacious mudroom/laundry room is the first space you see coming from the garage. Flooring is hardwood with herringbone tile under washer and dryer. Countertop is Steel Gray Leather Quartz. 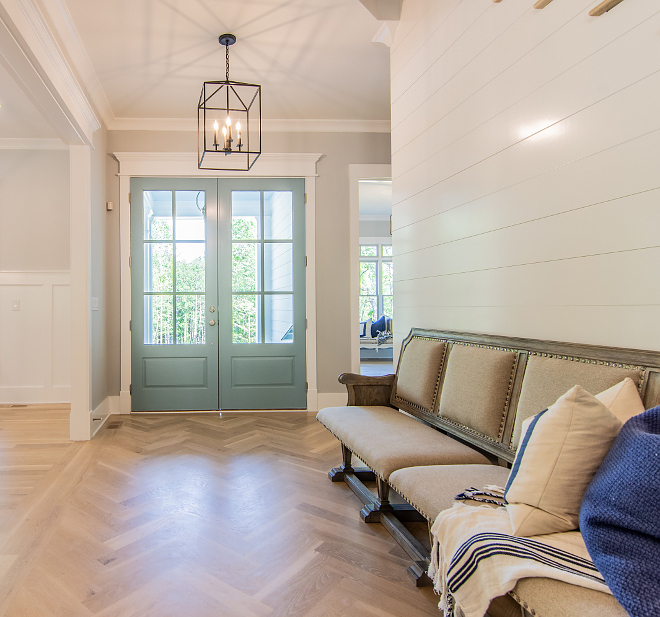 Similar Barn Door: Here – Chevron: Here. 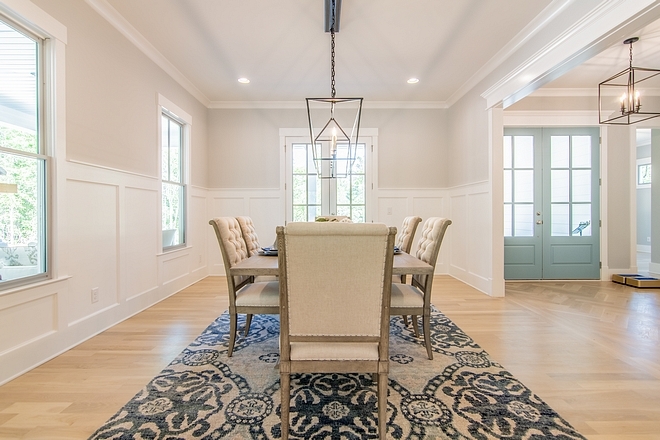 The rope chandelier is Savoy House – on sale! 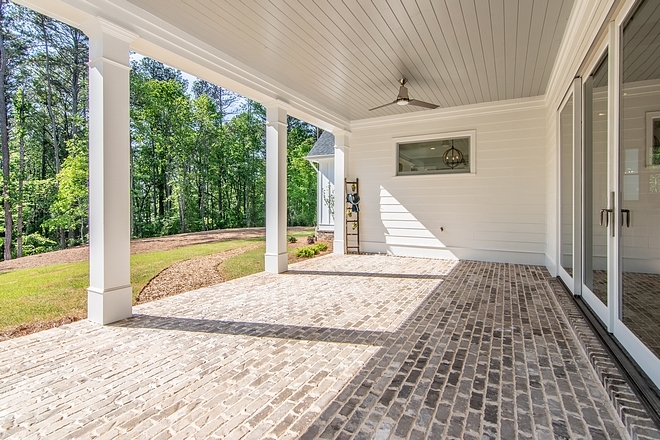 The brick porch features beautiful brick flooring and peaceful views. 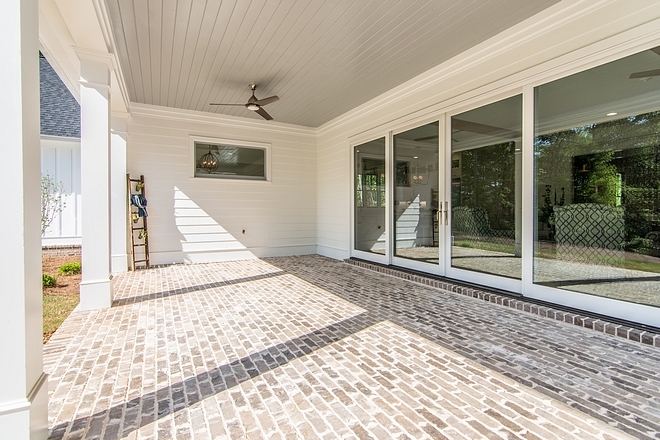 The family room opens directly to this expansive porch with brick flooring. 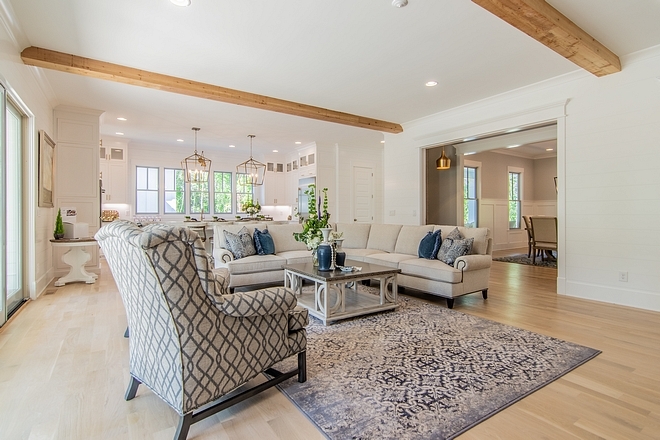 Design by Kraig Kelsey Interiors.